Josie Fearne (left) and Johnnie Fearne. The Fearne family is well-known in Cospicua, especially where football is concerned. The surname Fearne is linked with the good old days of Maltese football when the game was still played at the old Mile End ground and the Empire Sports Ground. Josie Fearne, the eldest of the two brothers, was one of the best Maltese players of the pre-league era. A sturdy centre-half, he led St George's through their heyday when they were the undisputed kings of Maltese football. Apart from captaining the team, he was also club secretary. Fearne played in many classic encounters against service teams at a time when service football was at its zenith. He also played against Floriana in the classic Imtarfa Cup encounter. When league football started in 1910, Fearne was already in the twilight of his career but he managed to play a handful of matches for St George's, guiding the team to victory in the 1911-12 Mile End Cup final against St Joseph's United, of Msida. After the First World War, Fearne emigrated to Australia, passing the baton to his younger brother Johnnie as captain of St George's. Fearne Jr learned his football in the open spaces within the bastions at Cospicua. In 1921, he followed in the footsteps of Josie and joined St George's. Josie had captained the great St George's side of the pre-World War One era. Johnnie soon settled in the team and together with full-back Karmenu Ruggier and 'Balolu' Busuttil at centre-half, he was part of one of the strongest defences on the island at the time. He soon caught the eye of other clubs and the next season he tried his luck with Sliema Wanderers where he teamed up with Toto Busuttil, another fine full-back of that era. 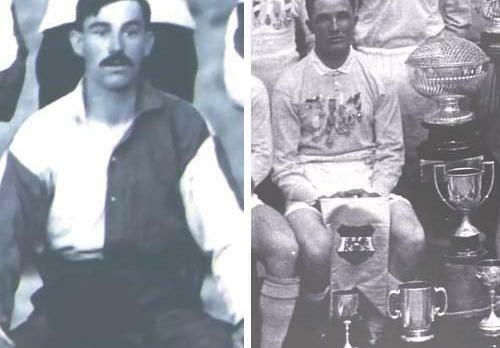 With the Wanderers, he stayed for three seasons, forming part of the team that won the league championship and the prestigious Aitken Cup in 1922-23. He also helped the Blues to win the Cassar Cup twice, in 1924 and 1925. At the end of season 1924-25, he rejoined St George's who were making a bold bid to regain some of their former glories. In 1927, he led the side to historic victory over Valletta United in the Cousis Shield final. It was a great moment for Fearne and for the old club of St George's, after many years of heartbreak and disappointment. It looked like Johnnie Fearne was destined to spend his career alternating between St George's and Sliema Wanderers. In 1928, after three happy seasons with the Cospicua club, he returned to Sliema but stayed with the Wanderers for only one season before returning to St George's. He was an automatic choice for the MFA XI. His most memorable occasions were the match against HMS Ajax, on the occasion of the inauguration of the Empire Sports Ground in 1922, the game against Hajduks in 1923, when the National XI beat the visitors 3-1, and in June of the same year when he captained the team that toured Italy.